This message delayed becaause of communications breakdown; thoughts still valid.. Fears and doubts, couched in terms of cynicism and the old fin-de-siècle blues, may truly be set aside after last week’s Philharmonic event at Disney Hall. Our young maestro has earned his spurs not so much with another whoop-de-doo orchestral Saturnalia but with a much-loved, subtle masterwork as much known for eliciting tears as cheers. The outburst of silence that Gustavo Dudamel drew from the capacity crowd last Thursday after his performance of Schubert’s “Unfinished” Symphony spoke as eloquently as any juncture loud or soft along this thoroughly satisfactory musician’s mercurial rise to fame. What a great night of music-making!… and what music! What is there about this B-minor half-symphony, this enchanted relic, that stands it apart from the rest of the world’s trove of abandoned beauty? Its story makes for good p-r: the hand of God signaling “enough” to its suffering composer; Schubert himself realizing that that he had taken musical language past a boundary that noone had previously crossed, realizing (justifiably) that the world wasn’t yet ready for him. The orchestral language – trombones especially – proclaims sonorities that only Richard Wagner, decades later, would attempt. The harmonies – just take the spine-chilling sequence that ends the slow movement in a radiant dark luminescence – still resonate as “typically Schubertian” because nobody has tried them since. 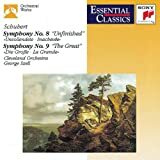 The considerable legacy of “unfinished” Schubert forms a tantalizing bundle of scribbled pages, yellowed half-sheets of whole symphonies, separate orchestral movements, along with piano sonatas, chamber works and songs. When I was a lad the world acknowledged seven Schubert symphonies; now there are ten, with the newly discovered “Tenth” looming large on last week’s Dudamel program. ASIN: B0000027XR It is a three-movement work, broad and oratorical in style. Its manuscript dates from 1828, Schubert’s last year. Its first movement starts with welcoming fanfares, shading off to a second theme nearly as gorgeous as its counterpart in the “Unfinished” (“This is, the Sym-pho-nee” etc. )Its slow movement is a long and haunting nocturne; one recent critic describes it, quite accurately, as a reminiscence of Schubert being remembered by Gustav Mahler, and that is accurate. The British scholar Brian Newbould has made these fragments into full symphonies, or single symphonic movements, a legacy of genuine Schubertian beauty where none existed before. Dudamel’s program included two “demummifying” ventures by Italy’s master-meddler Luciano Berio, both quite marvelous: one a, the other Berio’s “Rendering” of this “Schubert Tenth,” and a gathering with small ensemble of old-timey folksongs – such, for example, as the evergreen “Black, Black, Black” set for solo singer (angelic Dawn Upshaw). For the ensuing magical evening of Purcell the walls of Disney Hall seemed to close in and impinge upon our imagination. Four centuries later, the dramatic intensity of Dido and Aeneas is undiminished. The flights of harmonic and melodic daring, the dissonances — the cross-relations that pit, say, an F-sharp against an F-natural, the sudden wrenching modulation, a jagged melodic line out of nowhere – all these proclaim the lasting power of this amazing-if-arrogant British genius. From Susan Graham’s delivery of Dido’s first words of lamentation – “Ah, Belinda, I am press’d…” to her electrifying final imploring – “Remember me, but Ah! Forget my fate…” that joyous hall seemed sucked dry by tragedy irresistibly delivered, the needle-pricks of the strings of Nichola McGegan’s Philharmonia Baroque visiting from Berkeley. Graham, whom I had mostly heard in bel-canto and other Rossinian hi-jinks, delivered haunting, arching vocal lines with a fine command of vocal color, and with the strength to control coloration at an amazing range of vocal strength. I love looking at her tall, commanding good looks, and I love the broad range of her vocal strengths. We need her here. At long last we’ve had a full-length Piano Spheres recital by LA/’s own Eric Huebner, whose coiffure suggests that his splendid brain-case may be aflame both inside and out. A Juilliard kid –among other accomplishments, he has made local jaws drop with his Messaien exploits, among others. At Zipper Hall he honored California teachers including Roger Reynolds of UC-San Diego. Dan Rothman of CalArts, Chen Yi and George Tsontakis from all around. I particularly admired the Tsontakis Ghost Variations, a big piano panoramas that sounded notes of grandeur that awoke comparisons to Lisztian transcendental etudes, before settling back upon a paraphase of a Mozartian concerto finale (the grand and spacious K. 482). The considerable legacy of “unfinished” Schubert forms a tantalizing bundle of scribbled pages, yellowed half-sheets of whole symphonies, separate orchestral movements, along with piano sonatas, chamber works and songs. When I was a lad the world acknowledged seven Schubert symphonies; now there are ten, with the newly discovered “Tenth” looming large on last week’s Dudamel program. It is a three-movement work, broad and oratorical in style. Its manuscript dates from 1828, Schubert’s last year. Its first movement starts with welcoming fanfares, shading off to a second theme nearly as gorgeous as its counterpart in the “Unfinished” (“This is, the Sym-pho-nee” etc.) Its slow movement is a long and haunting nocturne; one recent critic describes it, quite accurately, as a reminiscence of Schubert being remembered by Gustav Mahler, and that is accurate. The British scholar Brian Newbould has made these fragments into full symphonies, or single symphonic movements, a legacy of genuine Schubertian beauty where none existed before. Dudamel’s program included two “demummifying” ventures by Italy’s master-meddler Luciano Berio, both quite marvelous: one a, the other Berio’s “Rendering” of this “Schubert Tenth,” and a gathering with small ensemble of old-timey folksongs – such, for example, as the evergreen “Black, Black, Black” set for solo singer (angelic Dawn Upshaw). At long last we’ve had a full-length Piano Spheres recital by LA’s own Eric Huebner, whose coiffure suggests that his splendid brain-case may be aflame both inside and out. A Juilliard kid –among other accomplishments– he has made local jaws drop with his Messaien exploits, among others. At Zipper Hall he honored California teachers including Roger Reynolds of UC-San Diego. Dan Rothman of CalArts, Chen Yi and George Tsontakis from all around. I particularly admired the Tsontakis Ghost Variations, a big piano panoramas that sounded notes of grandeur that awoke comparisons to Lisztian transcendental etudes, before settling back upon a paraphase of a Mozartian concerto finale (the grand and spacious K. 482). This entry was written by Alan Rich, posted on November 23, 2009 at 4:05 pm, filed under soiveheard.com. Bookmark the permalink. Follow any comments here with the RSS feed for this post. Both comments and trackbacks are currently closed. Thanks for the wonderfully worded opinions, Mr. Rich. Very glad to have them, even with the delays and communication breakdowns. Thank you for another typically AlanRichian piece of writing about music. As always, a pleasure to read. It was good seeing you in your usual WDCH seat during the BPO concert last Monday night. Did not see you there on Tuesday, but hope that you are well.